A couple weeks ago, I raved over the food at Sláinte, in Fells Point. It was a media dinner, and the food was free, but I did like it enough to go back and pay for my food. It was just as good on my dime. 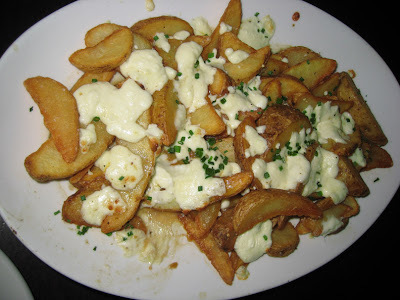 ...the poutine (potato wedges with a truffled chicken reduction and fresh mozzarella curds). While it sounds really exotic (it's Canadian, after all), think of it as fries with cheese and gravy, albeit a rather schmancy truffle-scented gravy. Sláinte's portion is huge, so prepare to share. 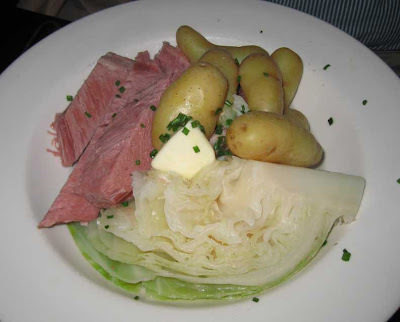 ...the corned beef and cabbage, in the hands of Chef Bill Crouse, was pretty subtle: a huge slab of tender beef, accompanied by a wedge of lightly-cooked cabbage and a pile of buttered new potatoes. Very simple, very plain, very good. 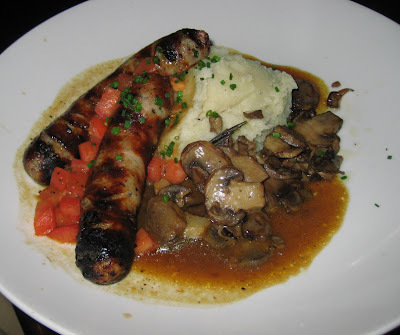 ...the bangers and mash included two very flavorful sausages - nice, meaty, American-style sausages, never fear - with an ample mound of champ (mashed potato with scallion), mushrooms, and tomato gravy. 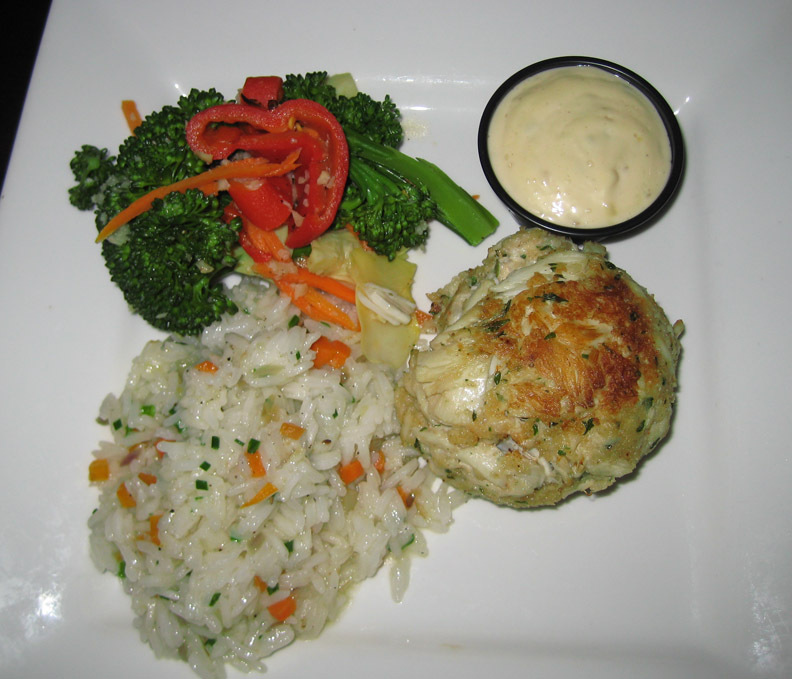 ...and the crab cake, which was filled with a nice mix of lump and other crab meat, was very moist. (I'd have like it broiled a while longer, though.) The vegetables, a mix of broccoli, red bell pepper, and artichokes, were crisp and very garlicky; while I liked the rice well enough, Sláinte slaw might be a better accompaniment. For dessert, we tried the Guinness bread pudding, which is a different preparation from what we were served at the media dinner. 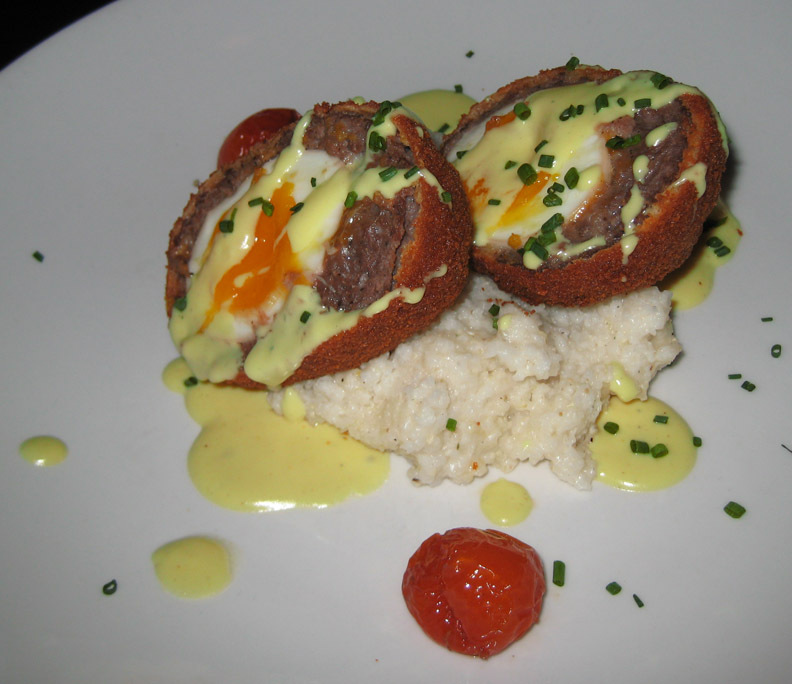 This was crusty and piping hot, served in a ramekin and an ample portion for two. I would have liked a little pitcher of custard, cream, or a scoop of ice- or whipped cream because it was a little dry. I'm already looking forward to my next trip, which will hopefully be a rescheduled girl's-night-out dinner with an old pal from high school. She's already been perusing the menu and trying to decide what to try first.